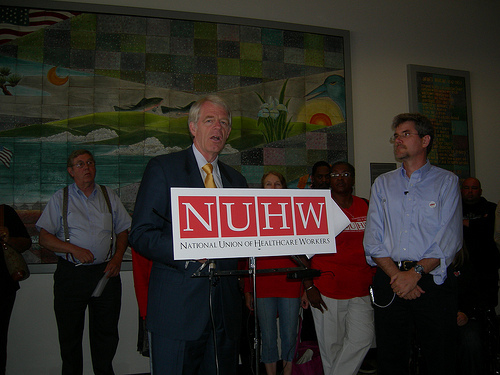 The wage increases were negotiated by the prior UHW administration - who is now NUHW. 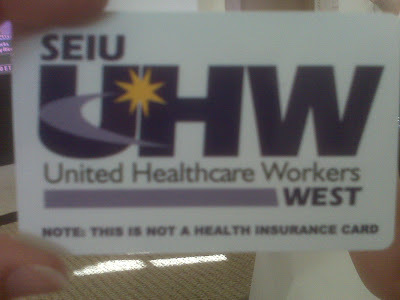 Health Insurance Benefits likewise were negotiated by the prior UHW administration. Direct Deposit is a minor thing that can be set up separately by your bank. No matter. Who can argue with such a swanky piece of plastic such as THIS? The UHW Identity Card - Don't Leave Home Without It! Now, I would have to assume that such cards would only go out to those who are completely up-to-date with their dues payments, or even only those who have their dues deducted automatically. The best part, though, is that they can limit these cards to "politically reliable" members. And when it comes time to vote on a contract, or when it comes time to vote on representation and decertification, they can look up at you and demand your "union ID card" prior to being allowed to cast your ballot. Membership does indeed have its privileges. Update from an alert reader: "Here is the backside. 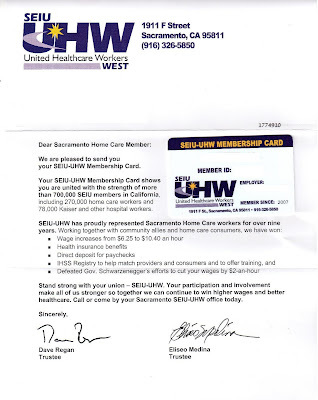 Note the disclaimer on the bottom, just in case a member is foolish enough to believe SEIU had offered them health benefits." 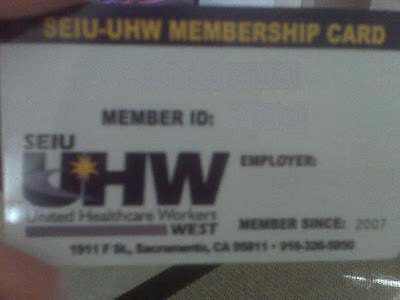 I wonder if this would absolve one of the "sins" of aligning oneself with NUHW, then retreating to the dark side only to be held up at the gates of hell (read: any UHW office) for lack of proper "ID"?! Pharmacy Agreement Going Down To Defeat?